28MAR77 Arrived at MASDC, Davis Monthan and assigned MASDC Production Control Number AACK0201. 26AUG17 Returned to Albion Park after being repainted in Wagga. Air Force Historical Research Agency via Mark Morgan, Air Mobility Command via Doug Boleyn, March 2016. 309th AMARG Marketing & Public Affairs, MAY07. Civil Aviation Safety Authority (Australia). Aircraft has returned to Albion Park after repainting in Wagga. Added a dusk take-off image thanks to Phil Vabre. Added another fine image from Phil Vabre. Major update from Source 1. Added an image of the aircraft at an open day at Essendon in 1996. Thanks to Phil Vabre. 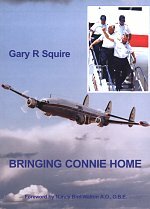 Added more details of the restoration and delivery flight drawn from Gary Squire's book "Bringing Connie Home". Added five new images of VH-EAG taken at Narromine in September 2007. Thanks to Phil Vabre for these magnificent images. Added dates in and out of MASDC thanks to Rob Raine. Added a new image to show progress with Connie's new hangar. Thanks to Bob De La Hunty. Changed base to Albion Park.